Panneau en aluminium pour dissiper la chaleur efficacement, procure un sensation de frais pendant que l’on s’en sert. N8 a de bons composants. Les deux ventilateurs lui procurent force et regard de star. Les deux ventilateurs permettent une grande performance de refroidissement, mais aussi une superbe prise d’air pour offrir un flux d’air optrimal pour refroidir votre ordinateur portable. N8 est fabriqué avec deux ports USB. Vous pouvez utiliser l’un pour alimenter votre refroidisseur et l’autre pour un usage autre. Panneau entièrement en aluminium pour dissiper la chaleur efficacement. Deux ventilateurs de 140 mm offrent un bon flux d’air et une grande performance de refroidissement. Bonne admission d’air pour offrir un flux d’air optimal pour refroidir votre ordinateur portable. While the Deepcool N8 might not have as many frills as some of the other coolers I have reviewed, it does provide a professional, crisp, look that many other coolers do not have. 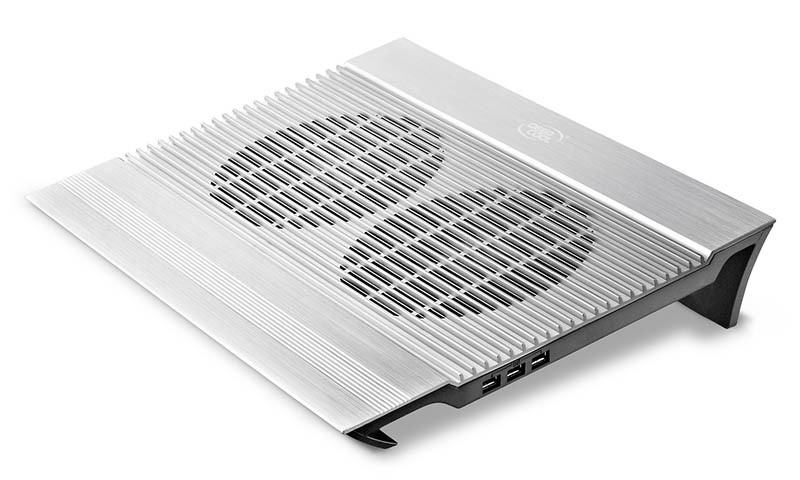 This, bundled with decent cooling ability, provided by the aluminum base as well as the two large fans, as well as a USB hub make it a good choice for anyone who wants to give out a professional appearance while on the go. Additionally, its smaller size allows much more desk space to be used for other things while still allowing a 15" laptop to be used with it. Finally, the tilt of the N8 allows the user to derive ergonomic benefits by placing the laptop's built in keyboard at a slant. Overall, I would recommend the N8 to anyone who is looking for a professional looking laptop cooler that can still get the job done. The DeepCool N8 notebook cooler is one of the better one’s that I have seen recently and does what it is supposed to do without any issues. I also like that DeepCool did not try and add a ton of extras on to the N8 like many manufacturers have done with notebook coolers. It is a notebook cooler and that’s it, plain and simple. The extra 3 USB ports is a plus since many notebooks do not have a ton of USB ports and you are giving one up to power the N8.